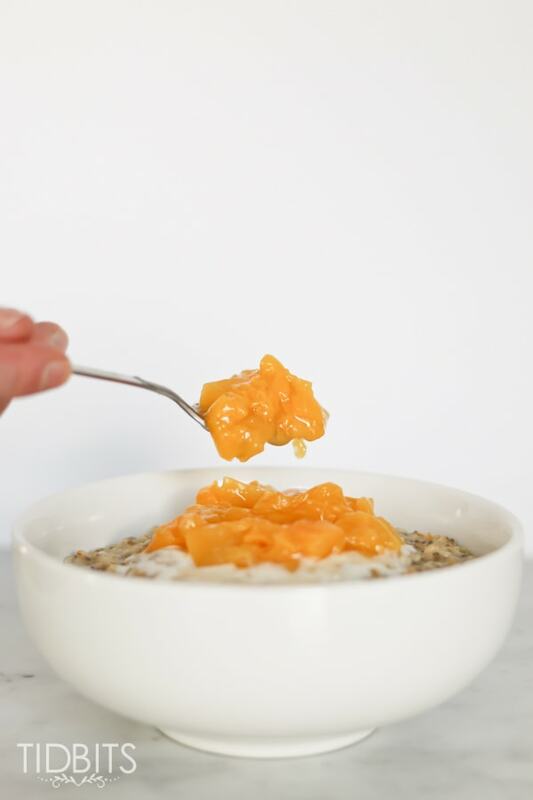 Peaches, cream, and a maple drizzle all over your oats is guaranteed to start any day off right! 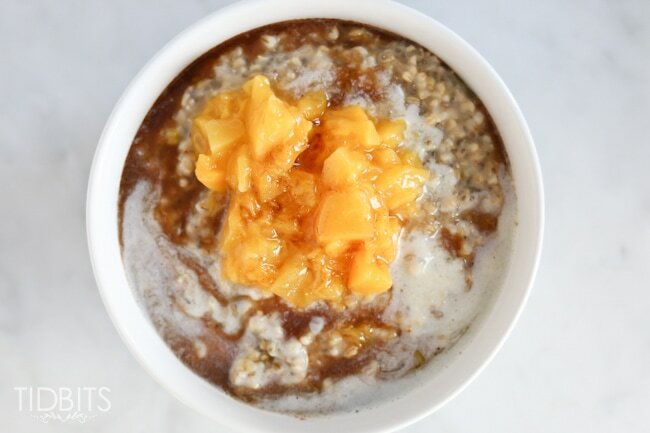 These pressure cooker peach steel cut oats are quick, easy and perfect for feeding a crowd! If I were of royal status and could have a steaming hot breakfast ready for me everyday after a hard morning run (because being royal doesn’t mean you don’t have to work for that beach body), this is what it would look like: a tower of soft, eggy french toast, stuffed with warm, sweet peaches, a cascading waterfall of maple syrup, a fluffy cloud of vanilla whipped cream and a sprinkle of cinnamon all served on a white platter etched in pure gold…do i really have to leave this moment to get to my point…one more second…okay, back to reality. 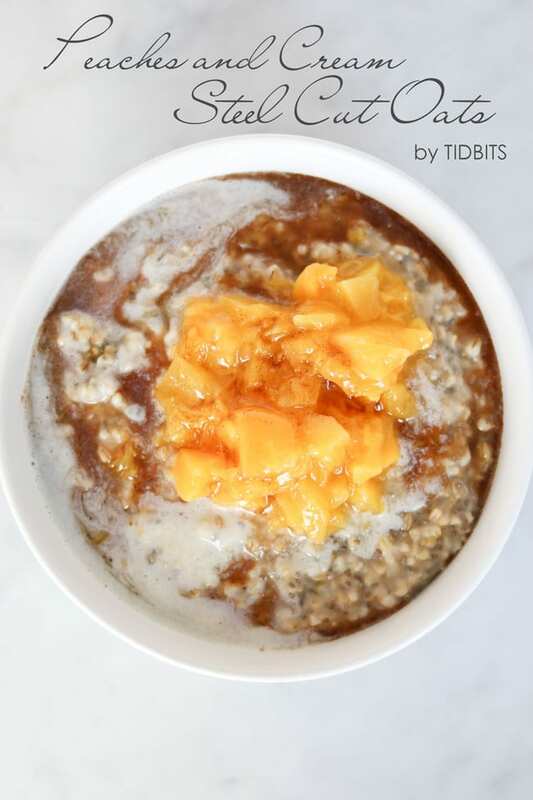 Since no one is cooking for me in the mornings, and no restaurant has been able to perfect my royal breakfast, I created this: Peaches and Cream Steel Cut Oats with a Cinnamon Maple Drizzle. 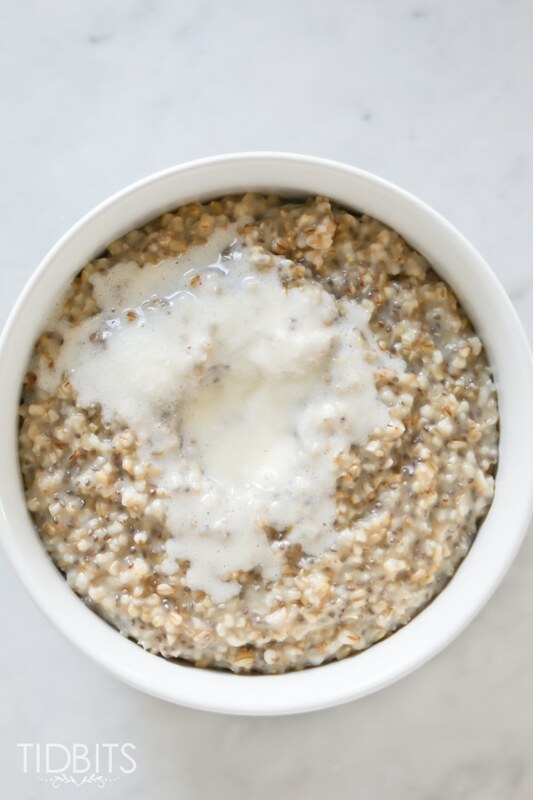 It hits all the flavor notes I crave plus it’s quick, healthy, and will keep you energized for HOURS because- chia seeds! One teeny, tiny little seed that gives my family the fiber and protein they need to really take charge of a day. Before we dive into the recipe, I'd like to walk you through the steps to layering this hearty breakfast just right. 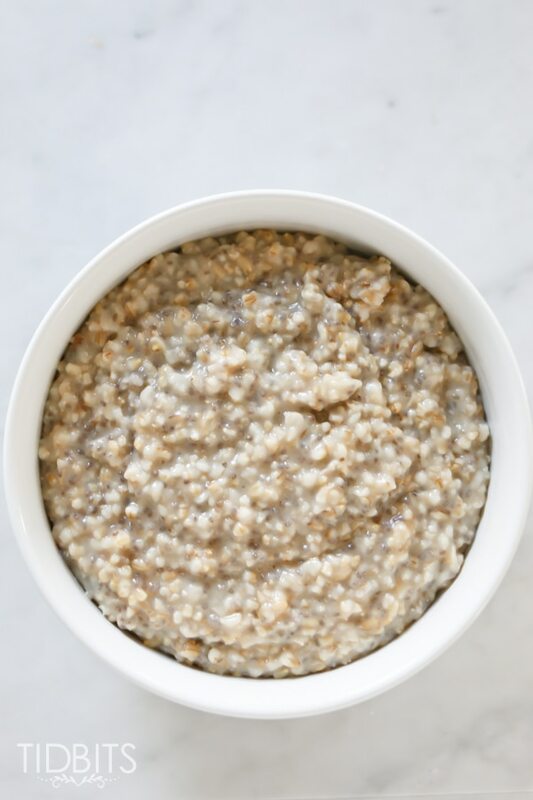 It all begins with a hearty serving of pressure cooked or slow cooked steel cut oats. 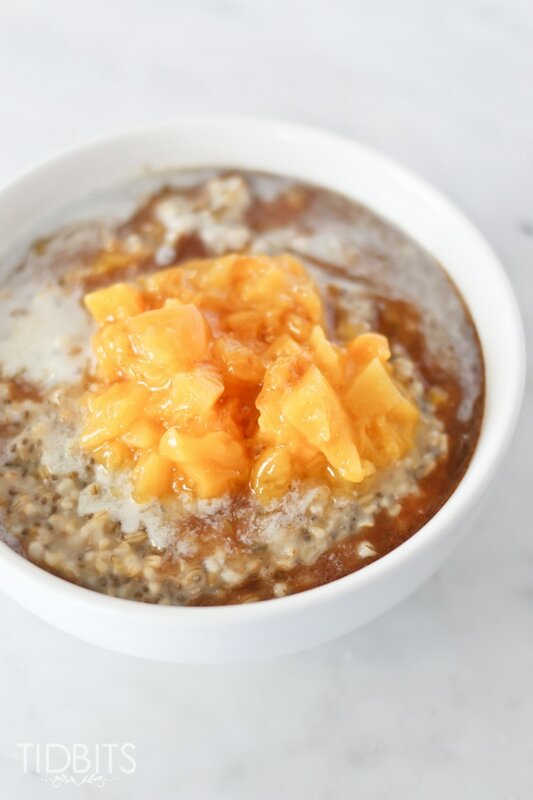 With the Fagor Lux Multifunction Electric Pressure Cooker, you can simmer your Peach Compote until thick and glossy, and then make this steel cut oat recipe at high pressure first thing in the morning or use the slow cook function to have it cook while you sleep. Either way, you’ll be pleased as peaches with the results. This recipe will include instructions for both functions. 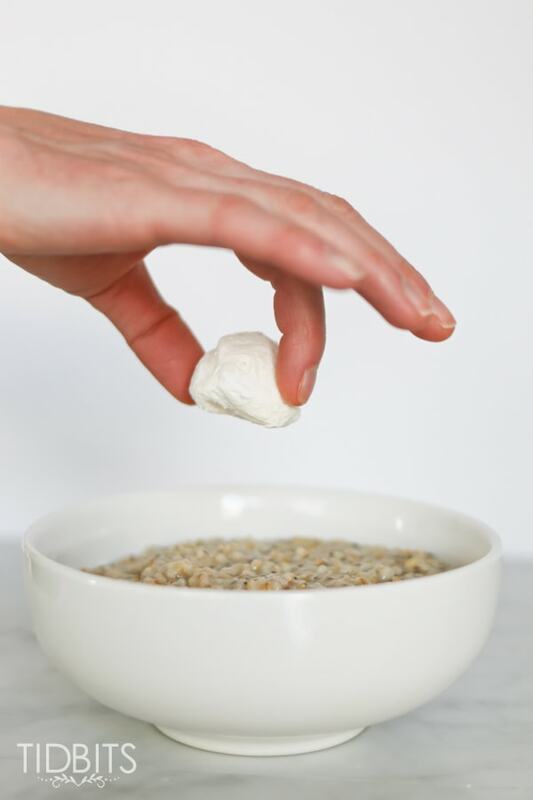 After you've served up your bowl of piping hot oats, plop a Frozen Whipped Cream dollop right in the center. Watch as it melts into a glorious, mouth watering pile of cream. Next, you'll want to warm up your Peach Compote (if you haven't already) and be as liberal as you wish with your serving size. To top it all off, you'll soak it with the Cinnamon Maple Drizzle. Power through your day with this hearty, healthy, and flavorful breakfast. Peaches are the star in this one! Add oats, water, and salt to the pressure cooker pot and stir. Secure the lid and turn pressure release knob to a sealed position. Cook at high pressure for 10 minutes. 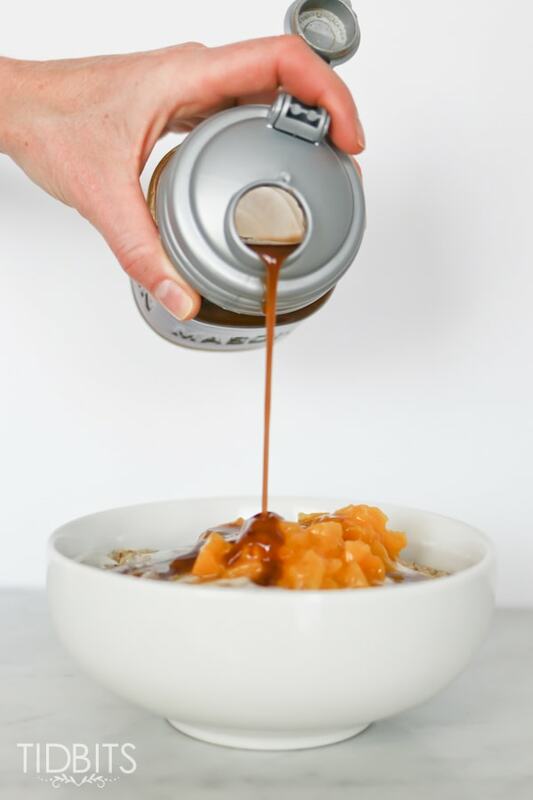 While oats are cooking, combine maple syrup and cinnamon in a small jar with a tight fitting lid and shake vigorously to combine. Set aside. When pressure cooking is complete, use a natural release for 10 minutes (can also use a full natural release, if not in a hurry). If liquid sprays through the valve, turn back to a sealed position and allow to cool for 5-10 more minutes. Sprinkle chia seeds over the top and stir in quickly so they don’t clump together. Place the lid back on the pot and let sit for 5- 10 minutes to allow chia seeds to swell. To serve, warm the Peach Compote in the microwave or on the stove top until nice and hot. 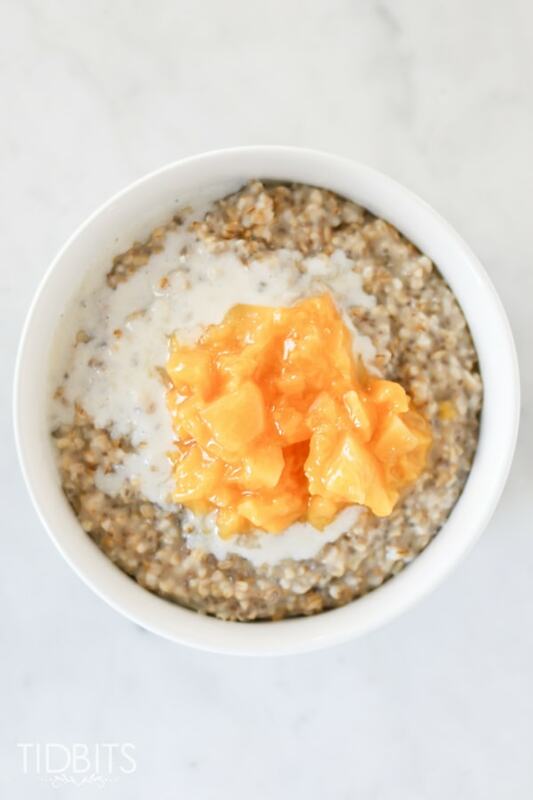 Scoop oatmeal into a bowl, top with a Frozen Whipped Cream Dollop, cover with peach compote, and then drizzle with Cinnamon Maple Drizzle. Enjoy these pin friendly images to save to your boards! 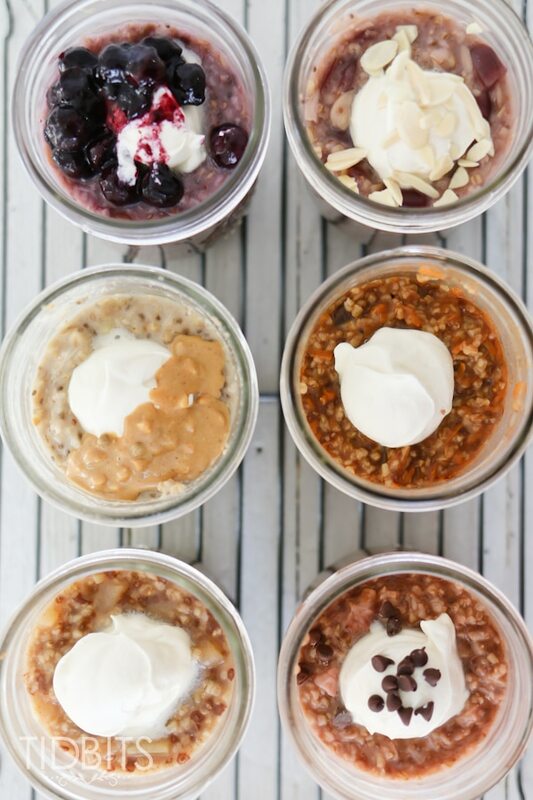 Wan't more steel cut oats goodies? Try this fun method in a mason jar. *This post contains affiliate links to products we use and love. Thank you! Cynthia, I believe there are only 2 or 3 in this PDF format. It was an experiment my sister and I did a couple years ago that we decided not to continue. Are you having problems with the others? I will add it to my to do list to get these PDF recipes switched over! Cynthia, I went ahead and fixed the peach compote and the peaches and cream steel cut oats. I’m not sure which other ones we did in this format, so I’ll get to checking that out. I hope that fixes it for you!